“The Uncas Leap Walking Trail,” features the Native Mohegan Tribe’s rich history in southeastern Connecticut, including a legendary battle with the Narragansett Tribe, the tribe’s friendly relationship with Norwich’s early settlers (which close relationship still exists today), and key sacred sites. “The Benedict Arnold Walking Trail” will discuss Norwich’s infamous native son and other Norwich figures during the Revolutionary War. 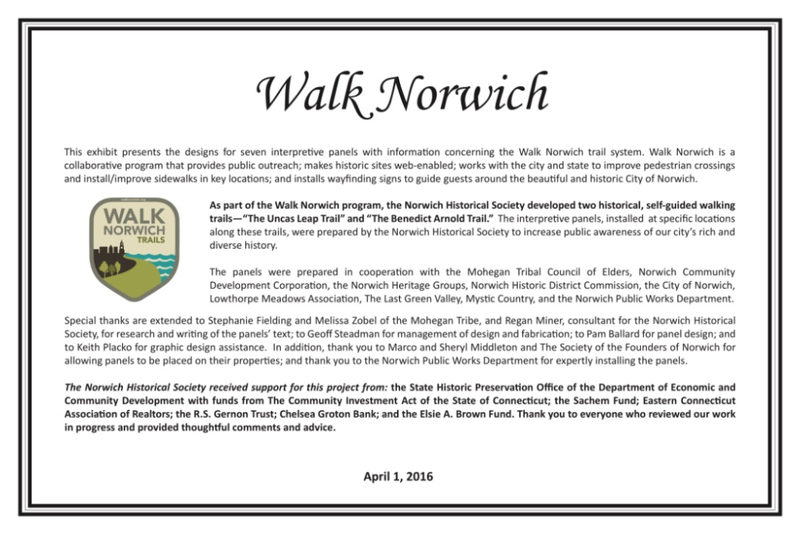 The Heritage Walk is a 2.8 mile roundtrip trail along the Yantic River and Norwich Harbor includes historic and interpretive signs describing Chelsea Landing. The Troubadour Trail is divided into 12 stops, within three sections. Some of the stops overlap with stops on other components of the Walk Norwich trails. The Millionaires’ Triangle Trail —bordered by Broadway, Broad Street, and Washington Street— was on the way to becoming the city’s finest residential district. Walk Norwich is a pedestrian advocacy movement in Norwich, Connecticut. The goal is to promote walking, request pedestrian improvements (e.g., sidewalks, crosswalks) and to educate residents and guests about the ease of walking in and around Norwich. working to develop a constituency (you and the people you invite) that can be informed and engaged in helping to achieve the goals listed above. Norwich’s approach is to develop the initial program over four phases, starting with the pre-colonial to American Revolution timeframe, then the Jeffersonian Period, followed by the Industrial Revolution, and completed with the Civil War and Civil Rights movements. The Heritage Walk is a 2.8-mile roundtrip trail along the Yantic River connecting historic downtown Norwich CT to the remarkable Uncas Leap Heritage Area. The first phase includes the development of two self-guided walking trails: “The Uncas Leap Trail” and “the Benedict Arnold Trail.” The ultimate result will be copious walking trails, interconnected / networked to each other. Our concept is to create a walking map that mimics the well-known transit maps in major cities (e.g., Boston MBTA Subway Map). For example, the Benedict Arnold Walking Trail will be the red trail on the map, and will have connecting points to other walking trails. The sightseer will be able to look at the comprehensive map of all the trails and determine the route needed to get to the location they want to travel. The objectives of the trails are to provide people with an interactive walking self-guided trail complete with trail marker signs, interpretive signs, and self-guided brochures. “Norwich’s Millionaires’ Triangle” will discover Norwich’s Industrial Era in the Gilded Age. At one time Norwich had more millionaires per capita than any other city in the United States. The rich and famous of the era, included William Slater, Leonard Ballou, and Henry Bill. Many of the homes are still in existence and are all conveniently located near Slater Memorial Museum and the Chelsea Parade National Register Historic District. This effort will include connectivity to the various mill village neighborhoods in the city (Greeneville, Occum, Taftville, and Yantic) along with the stories of millwork during that period. “The Norwich Freedom Trail” will start by emphasizing Norwich’s connection to President Lincoln during the Civil War. Norwich has many important natives during this period, such as the Acting Vice President of the United States – Lafayette Foster, and Governor William Buckingham. There are also significant places, such as the historic Yantic Cemetery where many civil war soldiers are buried, and the Wauregan Hotel, where Lincoln visited. The trail will also cover the Jacksonian Period in history and will include Norwich notables such as David Ruggles, James L. Smith and the Jail Hill National Register Historic District, located adjacent to historic Downtown Norwich. HOW IS THIS PROJECT INNOVATIVE? This project will utilize 21st Century technology to reach a broad audience. Each historic site located within on the trails will provide smart phone users with easy access to information about the various historical sites located along these routes. The web-based information can be sortable by type of story, type of asset, or a variety of other user-selected criteria, which will enable visitors to immerse themselves in the aspects of the story in which they are most interested. The GIS will enable proper coding to deliver these customized elements. Way-finding signs for the self-guided walking trails will direct sightseers along the route and informational signage will be located at each cultural site. Walking tour brochures complete with a trail map, color photos, trail information, and trail length / duration. The brochures will include information about local amenities. The Norwich Heritage and Regional Visitors’ Center, Norwich City Hall, Greater Norwich Area Chamber of Commerce, Otis Library, Slater Memorial Museum, and Leffingwell House Museum. Ideal Skate Shop of Norwich is selling Walk Norwich merchandise! 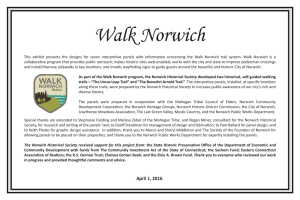 The proceeds benefit the Norwich Historical Society and the Walk Norwich Project.